Imagine having the forethought to buy gold to shield your finances from an economic or monetary crisis—only to have it taken away from you by your government. You’d lose not just the protective buffer you put in place but potentially a chunk of your net worth. When a grab is made for people’s savings, governments don’t bother to confiscate instruments like stocks and bonds and savings accounts—those can be wiped out by simply devaluing the currency. But when times are really tough, governments have “requested” citizens turn over their gold—the one asset they’ve historically been unable to control, since it’s not someone else’s liability. When a gold confiscation happens, there unfortunately aren’t a lot of viable solutions. If your government declares it illegal to own a meaningful amount of bullion, you’d have little choice but to comply. Either that or play the role of a fugitive—with the prospects of financial penalties, forcible confiscation of your metal, and even jail time waiting for you. Many investors believe gold won’t be confiscated today because it’s not part of the monetary system like it was during the U.S. nationalization in 1933, under Roosevelt. While it’s true we’re not on a gold standard today, if the crisis gets bad enough any and all viable solutions could be on the table. Debt in all developed countries is unpayable, for example, especially when you add in unfunded liabilities… where could the government get funds to service it all? One source could definitely be gold. The sober reality is, while lower than in the past, the risk of a gold confiscation is not zero. The world today can be an uncertain place, and what were once “local” issues can rapidly escalate and have global consequences. This does not mean, however, that we are suggesting a gold confiscation is imminent or even probable; simply that it could happen if one or a series of events having significant worldwide implications occurs. Without official gold-backing on most major currencies today, the specific motivation to “confiscate” gold that existed during many previous confiscations barely exists today. But as you’ll see, even that hasn’t stopped modern government’s without a gold standard from doing the same, ostensibly as a form of currency controls to slow down market-driven devaluation. There’s lots of speculation floating around the Web about what one might do if gold was confiscated again. Unfortunately, the majority of the most common solutions don’t hold up to much scrutiny. Many dealers claim numismatic coins would be excluded, since there was an exception made for rare coin collectors in 1933. But as history will show, during past confiscations the onus was on the investor to prove they were a coin collector and not a bullion buyer. Unless you owned a substantial amount of rare coins, you were automatically deemed a bullion owner, not a collector. Political leaders can and will do whatever they deem necessary at the time. In any way they see fit. For as long as they think it’s needed. When the gold investor considers the number of ways a confiscation could take place, how long it could last, how easily the government could change the rules and how deeply it could reach—all against the backdrop of an economic or monetary crisis—it underscores the need to put a viable strategy in place. Since 1933, there have been a few notable gold confiscations around the world. The specific circumstances varied, but there was one common thread to all of them: they all arose out of a financial crisis. As government coffers dwindled and reached emergency levels, politicians didn’t hesitate to grab the net worth of private citizens. And in many cases it was portrayed as patriotic; your country is threatened—help save your nation! It basically meant that private owners were required to take their coins, bars or gold certificates to a bank, and exchange them for US dollars at the prevailing rate of $20.67 per ounce. Why did he do this? The US was on a gold standard at the time, so hoarding gold (i.e., money) was seen as a threat to the stability of the country’s financial system. Remember how bad things got… banks were shut, unemployment soared, bread lines formed, civil unrest grew, and the government couldn’t make its debt payments. Roosevelt desperately needed to remove the constraint on the Federal Reserve that prevented it from increasing the money supply the Great Depression was already four years old and wasn’t showing any sign of abating. Within nine months after making gold illegal to own, the president raised the official price to $35 per ounce. The dollars those ex-gold owners received in exchange had just been devalued by 40%, overnight. Did FDR Confiscate Gold in 1933? During the Great Depression, President Franklin Delano Roosevelt nationalized the gold holdings of U.S. citizens in 1933. He did not however “confiscate” gold. That is a common misconception. Instead, citizens were compensated for what they voluntarily turned over to the government. In a true confiscation, your assets are seized with no compensation. Should a severe national crisis arise, it’s certainly possible the government wouldn’t be able to afford to pay investors the full value of their bullion. Worse, the ban on private ownership of gold in America—the home of the free—lasted over four decades. Not until January 1, 1975 could US citizens own more than $100 in gold again. The Australian government similarly nationalized gold. The law, part of the Banking Act in 1959, allowed gold seizures of private citizens if the Governor determined it was “expedient so to do, for the protection of the currency or of the public credit of the Commonwealth.” In other words, they made it legal to seize gold from private citizens and exchange it for paper currency. The law also said you weren’t allowed to sell gold, except to the Reserve Bank of Australia (their central bank). Nor could you export any gold (send it outside the country) without the bank’s permission. While it is unclear whether or not the country moved ahead with active seizures, or just how many citizens complied, the law still destroyed the local private gold market overnight. Ever since Great Britain went off the gold standard in 1931, their currency had been falling. As the decline stretched from years into decades, many investors began to store gold overseas, worried their country might never recover. Who could blame them? Their standard of living was threatened. To stem the decline in the Pound Sterling, in 1966 the government banned private citizens from owning more than four precious metals coins. It also blocked imports of gold coins (a common move to keep currency from being exported, similar to modern day tariffs on gold imports in places like India). The only exemption to owning more than four coins was to prove you were a collector. You were required to apply for a license, and then an officer from the Bank of England would determine if you were a true collector or not. If not, we’ll take your bullion, thank you very much. The important distinction about this gold ban is that it occurred when Great Britain was not on a gold standard. In other words, we have historical precedence that gold was confiscated without it being part of the monetary system. Gold is not part of the monetary system today, either. Like most confiscations, this law lasted a long time—until 1979, a full 13 years. 1. Were imposed by Western governments. These were advanced societies, among the richest countries on the planet. And yet they all confiscated gold. 2. Arose out of economic crisis. Each government had abused its finances so badly that it eventually nationalized privately held gold from citizens. 3. Lasted for a LONG time. Of these confiscations from advanced economies, the shortest was 13 years. 4. Completely forbid any type of hoarding of bullion. Only true collectors were exempt, and only those pieces that were truly classified as rare. And you had to prove it. Interestingly, gold jewelry was not part of any of these confiscations. Benito Mussolini—Italy’s prime minister turned dictator—tried to fight a nasty recession by introducing the “Gold for the Fatherland” initiative in 1935. He “encouraged” the public to “voluntarily donate” their gold rings, necklaces, and other forms of gold to the government. In exchange, citizens received a steel wristband that bore the proud words, translated, “Gold for the Fatherland.” It’s said that even his wife Rachele donated her own wedding ring in a show of solidarity. Hitler’s Nazi party pulled a tricky scheme in 1939… after the invasion of Czechoslovakia the year before, the Bank of International Settlements, chaired by Bank of England director Otto Niemeyer—a German no less—instructed the Bank of England to transfer £5.6 million of gold from the Czech national bank to the Reichsbank. Even though the gold belonged to Czechoslovakian government, and even though English authorities had been warned of the possible transfer, it went through without a hitch. To mask the theft, Germany’s central bank understated its official reserves later that year. The madman of Iraq and the communist oppressor of Cuba both confiscated gold, art, jewelry, etc. These brutal dictators took whatever they wanted, at the point of a sword or gun. As you might surmise, citizens were not compensated when their holdings were seized—unless you count remaining alive as compensation. Based on interviews I’ve conducted with two large gold bullion dealers in Russia, the old Soviet Union has historically viewed gold and silver as a matter of national security. Therefore, private ownership in any form—except jewelry and numismatic coins—was strictly forbidden. People went to jail for owning a gold bar. And in spite of the Russian central bank being one of the biggest buyers of gold since 2008, those old laws are still on the books. It is illegal to buy or sell bullion bars except at a bank that has a precious metals license (and very few have them)… it is a criminal offense to buy or sell a gold bar from a friend or relative… transporting bars has strict rules and can send you to prison if you break them… it is illegal to take bullion bars out of the country… buying and selling foreign-made bars is also illegal. These laws are not as strictly enforced today, but they remain on the books and thus could be easily activated again. You can buy gold coins, but they’re not abundant and are in poor quality. What About India’s Government Schemes? The reason these schemes haven’t worked is because gold jewelry in India is viewed as an investment, not an adornment. Although they have coins and bars, the vast majority of gold in India is in jewelry form. It is thus more accurate to view “jewelry” demand in India as investment demand. • The difference in gold confiscations between the plunderers vs. those from advanced economies is that the plunderers were more oppressive about the confiscation, typically took more than just gold, and of course were more brutal in carrying it out. There’s another crucial distinction. Except during times of active persecution, there is no historical precedence of gold jewelry being confiscated. If a nation operated under the rule of law, seizing jewelry wasn’t part of the government’s strategy. The reality is that in a crisis, we could potentially face a lethal combination: a desperate government, with your assets ready for the taking. The point to all this isn’t to predict that there will be a gold confiscation. The idea is be aware of the risks and to have a viable plan in place to combat one if it occurs. But is there really such a strategy? On the surface it would seem that short of renouncing your citizenship and moving out of the country, there are precious few options to protect against such a draconian act. Storing gold and silver where a government is less likely to be able to reach it quickly and easily is smart buffer to put in place. First, as many have noted before, keeping it outside the banking system is a good step. Many references cite how banks have been known to hypothecate gold, i.e. lend it out to someone other than its rightful owner, putting it at systemic risk. Just as importantly, during the modern “bail-ins” we’ve seen in debt-stricken countries, banks were often working hand in hand with governments to seize assets long before citizens found out what was happening. The threat of being cut-off from central bank liquidity is an existential threat to banks, and thus they are not known for going to bat for consumers in court to block overreach like an independent vault provider hopefully would. Another step further removed is storing overseas—also in a vault outside the banking system. It puts your assets one step further out of reach. Less low hanging fruit, as they say. Without the ability to take quick possession, you have more time and distance to fight such an order. If the company holding your metal is a domestic entity, they might be forced to comply anyway, at least in reporting your holdings so they can be taxed in lieu of surrender. Some suggest you should instead do business with a foreign company. But that adds a different risk, and one that comes with a dubious level of added protection. First, you give up access to the local rule of law. If a vault in Singapore swears your gold is there, what will you do if it ends up not being the case? When dealing with a domestic company, at least you can turn to the court system. Second, a foreign company can be compelled to cooperate with a big enough foreign government, like the US. As investors using private banking services in Switzerland discovered in recent years, the threat of being cut off from banking with the US will quickly convince a company, or its host government, to comply with a confiscation order at least by reporting holdings. Even if it does not relent to pressure from abroad, the foreign entity would almost certainly refuse to deliver, buy, or sell precious metals in a jurisdiction where authorities have issued a confiscation order, leaving you only with the option to relocate elsewhere—hardly better, and often much worse than using a domestic provider you have real recourse against. Bottom line, while not risk free, private foreign vault holdings, whose affordability surprises many precious metals investors, stewarded by a company based in a nation with a historically strong rule of law, can be one of your best lines of defense if confiscation is a concern. You probably know that the queen of the silver screen loved jewelry. Her collection fetched over $156 million after her death. She even wrote a book about her jewelry. Indeed, it’s hard to find a picture of her without gold, diamonds, or pearls draped over her neck or wrists. You may also know that Elizabeth Taylor traveled a lot. At various points in her life she had homes in Beverly Hills, London, and Switzerland, among other places. She even traveled to Iran a few years before the Iran Hostage Crisis. And here’s an interesting fact about her travels: she always took some jewelry with her—and walked right through customs with it. No messing with customs forms, no requirement to declare a financial asset. This circumstance remains true today. You likely know that when crossing borders, travelers are often required to complete customs paperwork and declare large amounts money they are carrying, anything over $10,000 for travel to/from the US for example. The new rules specifically mention gold, and also that the price of the gold determines if you are at the reporting limit (not the face value on a coin). That means 7 ounces of gold would be the maximum you could carry at $1,300 gold. You’d be at risk with 5 coins when gold reaches $2,000/ounce. Since gold jewelry is not considered a financial asset under US law, it does not require reporting. Nor have we discovered any country where it’s handled differently, though always be sure to check the laws along your itinerary. You and your loved ones can employ your very own Elizabeth Taylor solution. Consider the advantages you’d possess if you wanted to transport some gold outside the country… it would be a lot easier to hop on a plane wearing a few necklaces or bracelets than carrying a stack of gold coins or bars. Consider the hassle you could avoid passing through customs, as well as the threat of your bullion coins being questioned or seized. But what about confiscation? As history has shown, in the developed world, gold confiscations have targeted monetary metals, like coins and bars. Jewelry was spared. Only in oppressive nations, ruled by dictators, was it a target. In other words, the resident of a developed nation that owns gold jewelry has an asset that is far off the radar of appealing assets to grab. The problem with most “gold” jewelry sold in the West is dilution. It’s often made with cheaper alloys that contain only a fraction of gold, and is very expensive relative to the actual precious metals content. Mark-ups are easily two and three times the gold value, and it’s not hard to find it four or even five times higher. That takes gold jewelry far from its roots, when it was a form a wearable wealth, meant to keep assets close at hand. Traditionally in Europe and Asia, gold jewelry was a more portable alternative to art, heirloom furniture, and land as outside-the-bank assets that held their value and were easily passed between generations. Today in India, China, Thailand and elsewhere the tradition remains—the Thai currency, Baht, for example, is even named for a common jewelry style that pre-dates it. And that’s exactly what we’ve recreated with our exclusive Gold Without Borders jewelry line. These investment grade 22-carat (91.6% gold, same as an American Eagle coin) and 24-carat (99.99% pure gold) pieces are an affordable alternative to the mostly costume jewelry you find in today’s stores. Classic designs that provide much more bullion for your money. And of course, they’re beautiful. Bullion jewelry is a real asset that is both portable and practical—you can wear it, transport it, and a confiscation order is likely to bypass it. Discreet, wearable wealth. 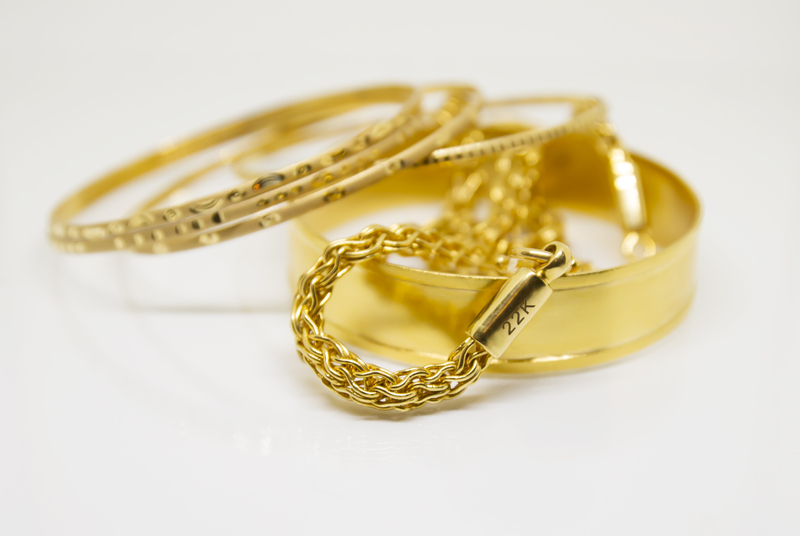 Check out the numerous pieces GoldSilver offers in their new Gold Without Borders jewelry line. It may just offer the solution you’ve been looking for.